The US decision, supported by the South Korean government, to deploy an antimissile system known as THAAD (Terminal High Altitude Area Defense) may be one of the most thoughtless strategic moves in a generation. The official US argument is that close-in defense against North Korean missiles is necessary. But the deployment has resulted in the following: an argument in China for increasing its nuclear weapons stockpile; an incentive in North Korea for moving rapidly ahead to develop its long-range missile capability; a deep fissure in China-South Korea relations; a roiling of South Korean politics at a time when its corrupt president has been impeached; and a new issue in Sino-US relations. Most of these negatives were well known when THAAD was initially on the drawing board several years ago. Yet they were thrust into the background on the argument that the North Korean missile threat to the continental US was so pressing as to warrant building a defense against it. Never mind that any North Korean missile attack, whether on South Korea, Japan, or the US, would result in the immediate and utter destruction of North Korea military and political institutions, as Kim Jong-un and his colleagues surely understand. But rather than consider the possibility that North Korea’s nuclear weapon and missile buildup is intended to deter a US attack, and rather than weigh a new diplomatic overture to the North that might reduce tensions and thus the need for THAAD, US leaders in the last two administrations went ahead. Lay the decision at the door of the “military-industrial complex” if you will, the fact remains that planning and deployment of THAAD is a decision where the risks and costs far outweigh any benefit. And the supposed benefits are already shrinking. North Korea now has a formidable array of short- and intermediate-range ballistic missiles, and seems close to deploying an intercontinental ballistic missile. Its latest test, in which four IRBMs were launched into the Sea of Japan, may be just the beginning of a new round of missile testing as the North evidently seeks the ability to overwhelm THAAD and pose a credible threat to neighboring countries and in theory to the US west coast. But as the North Koreans see it, their security is under threat—from deployment of THAAD and from the major annual joint US-South Korean exercise known as Foal Eagle that is now underway. In the absence of any diplomatic initiative from the US and its allies, Pyongyang’s logic is to forge ahead with nuclear and missile development so long as the US presents no incentives for choosing a different route to security. Meantime, the Chinese, who have been riled about THAAD for years, now may unleash their own countermove. Their argument is that THAAD threatens China’s strategic situation by reducing if not neutralizing its theoretical ability to respond to external attack. Beijing has never been persuaded by US arguments that THAAD is solely directed at North Korean missiles. 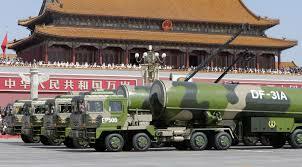 Since China sees THAAD as actually directed at it, the logic in Beijing is to respond by expanding its nuclear weapon and missile inventory. Another cost of THAAD deployment is the sudden end of the China-South Korea honeymoon. Until recently China was on a roll with South Korea in everything from trade and investment to tourism, entertainment, and educational exchange. Thanks to THAAD, South Korea is now on China’s enemy list: South Korean goods and entertainers are being boycotted, and some Chinese sources are calling for direct political and even military action against South Korea. This rupture bodes ill for Chinese cooperation on UN-authorized sanctions against North Korea. Deployment of THAAD could not have come at a worse time for South Korea. A decision by a constitutional court is imminent on the political fate of President Park Geun-hye, who has been forced to step down in the wake of corruption charges. If, as expected, her removal by the national assembly is upheld, a new election will be held. By then THAAD will have been fully deployed, making it very difficult for a liberal president—who would be Moon Jae-in, currently the front runner—to reverse the decision. South Korea’s next leader thus will start out having to deal with a major foreign-policy crisis. Finally, THAAD adds to the mix of policy differences between China and the US. President Trump’s administration has already shown little interest in or experience with East Asian affairs, and has made some serious missteps on China. The last thing Trump needs as he deals with “Russiagate” and numerous domestic challenges is a major dispute with China and an ever-enlarging strategic problem with North Korea. THAAD worsens his options. Washington should act immediately to indefinitely delay full deployment of THAAD. Doing so would reassure China, and might also be a bargaining chip to freeze Chinese weapons deployments in the South China Sea. Delaying THAAD would also remove a contentious issue from the South Korean political scene, and—if accompanied by revival of talks with North Korea—perhaps put a brake on the drift toward confrontation with Pyongyang. Unless the Trump administration starts paying attention to THAAD’s liabilities, it will face a cold-war style crisis at the same time that the US and Europe are in the midst of another cold war with Russia. Next Post #156: What Is Rex Tillerson Up To? The North’s recent nuclear demonstrations have been dangerous and provocative to all involved: certainly South Korea and Japan, but also China (which cannot possibly feel secure with Kim-Jong un at the controls.) You make out a case for at least temporary US restraint on full deployment of THAAD citing potentially favorable impacts on South Korea and China. Perhaps that alone justifies your proposed course of action. But it really begs the question of the threat from North Korea. If the US were to take THAAD off the table, do you really think Kim responds in kind? What’s the evidence for a cessation of the North’s nuclear development program? The Times reports that the North’s capacity to launch multiple attacks probably overwhelms THAAD’s defensive capability. If so, how useful is THAAD as a bargaining chip? Larry, you present a very good question regarding North Korea. I agree with Mel that THAAD is a poor strategic choice for the region, and it may even be a poor tactical choice for the US military. Still, in my opinion, THAAD has virtually no effect on North Korea’s nuclear and missile development programs. The North has followed a very rational and scientific approach to their programs — research, build, test, repeat — that has continued unabated for years. To presume that THAAD has suddenly (within the past year) altered their rationale seems to be hope misplaced. THAAD is no bargaining chip, because the North isn’t bargaining. Keeping or removing the system will not change North Korea’s belief that being a nuclear power guarantees equal standing in the international community with great powers. However, removing THAAD will indeed improve relations with China if South Korea wishes to go that way. The one good thing about THAAD, again in my opinion living here on the peninsula, is it has shown South Koreans that China is not a friend to be trusted. The ire rising here in Korea for China’s seemingly complete disregard for the South’s national security situation is becoming palpable. It has also reminded people how little pressure China has applied to North Korea over the past decade+ of their nuclear and missile development programs. Mel is right that the new president will have a foreign policy crisis from day one, but THAAD is a symptom of a much larger issue — China and other major powers have little leverage or incentive to curtail North Korea’s behavior. It is a buffer for China and a bogeyman for the US and THAAD, or lack of THAAD, won’t change that.